Unfortunately, scammers know this too. So there’s been a proliferation of dishonest and unethical apps and websites popping up, eagerly hoping to shovel garbage into your phone along with wallpapers. And when people are getting something for free, they often don’t even realize what the scam is until its too late. One of the most common scam is app based. Wallpaper apps, which use free stock photography and have absolutely no expenses, offer a three-day “free trial” and then automatically renew the subscription at $80 per week. Of course, you’re sure to realize once the first bill comes that you’ve been screwed and cancel the subscription, but that won’t get you your $80 back. If you leave a negative review, the developer will create a point update of the app, wiping out previous reviews and getting ready to sucker other unsuspecting users. By comparison, the more common $8 per week seems downright reasonable, until you remember you’re paying a weekly fee to download public-domain pictures for no reason. Part of the problem here is Apple’s too-subtle subscription dialog box. It looks so much like the free app dialog that it can be hard to tell what you’re agreeing too. And since the App Store requires the same Face ID security for a free purchase as a $500 purchase, there are few clues to inform users outside of reading the very tiny print. 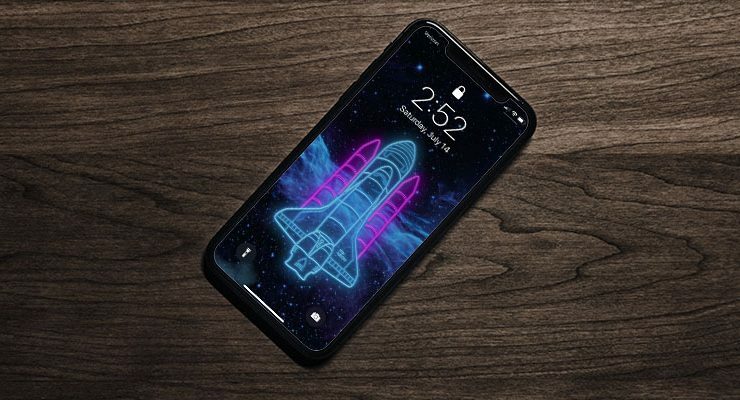 So how can you get your wallpapers without getting scammed? We’ve braved the murky waters to return with some downright exceptional sources for wallpaper. None of the apps included in this list offer a ‘free trial’ or anything unethical or sneaky. Of course, these are just images, so they’ll work on any device out there. The largest category of wallpaper sources actually comes from iPhone apps. These come with a number of images pre-installed, or download images on demand when requested. 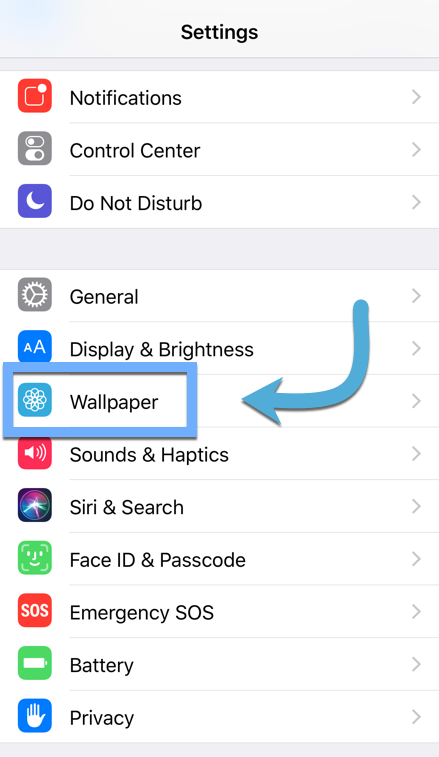 In all cases, the images you like are saved to your camera roll, from where you set them as wallpaper. Let’s review how to do that quickly. 2. Scroll down to Wallpaper and tap the menu. 3. Tap Choose a New Wallpaper at the top of the screen. 3. Select your new wallpaper from your Photos library. 4. Once you’ve selected your photo, move it around until it looks good. You can choose two options as well: Still or Perspective. Still will set the image exactly as you place it. Perspective will place the image optimally, so you appear to look “around” the image as you hold your phone at different angles. It’s a cool effect on photos with the illusion of depth, but doesn’t do much for flatter compositions like the example. 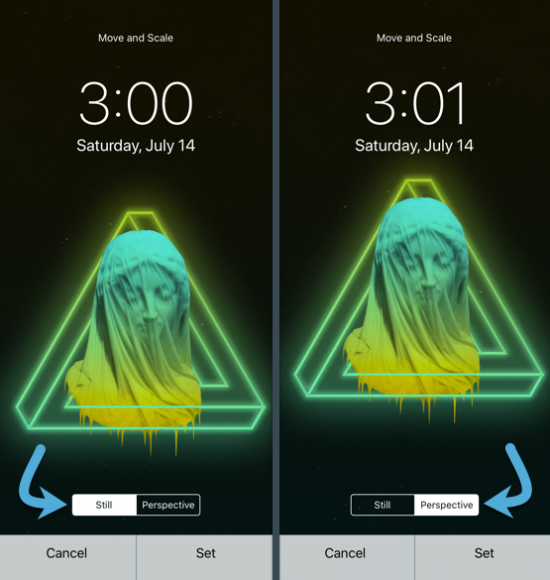 Then pick whether you want it on the lock screen (the screen you see when you wake your phone), the home screen (the wallpaper behind your apps), or both. 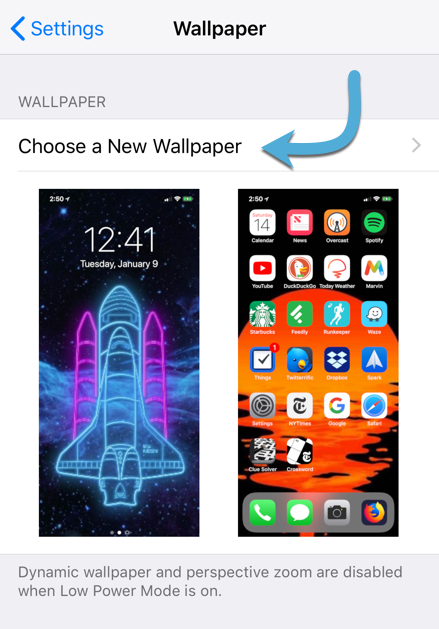 Without further ado, here are the best wallpaper apps for the iPhone X.
Vellum provides artsy, abstract phone backgrounds that aren’t too distracting but still express some individuality. You won’t find photos of common objects. Instead, you’ll see procedurally generated abstract art and images from the surface of Mars. There are some good collections, some mediocre, but it largely depends on your taste. Even the images that don’t match my taste do make good wallpaper. Well-known purveyor of free stock photos Unsplash has their own app for making those photos into wallpaper. Select an image from any of the thousands available on the site and download to your camera roll to set as a wallpaper. The images are all high-quality and aesthetically refined, but not all of them make good backgrounds. Many are too busy, too varied in tone, or suffer from being obscured. There is greatness in there, but you have to dig to find it. Oh, and there’s also Background, an app “powered by Unsplash” that seems to provide exactly the same pictures, but with less search functionality. It’s not on my list of favorites. Illustration, once a dying medium, has enjoyed an incredible comeback in the digital age. Unexpectedly, in an era where literally everyone carries a camera, the hand-made quality of illustrations is appealing. Walli focuses on that, stuffing the app with incredibly high quality illustrations, all available for free for personal use. There’s a smattering of photos as well which are also up to the standards of the illustration, so you’ll find only gold here. Atlas has kind of a unique take: it makes phone backgrounds out of maps. Type in any address and see an illustrated snapshot of the street map from above. Set the colors you like the best, then download. If place matters to you, this app will help you express that. Choose your color scheme carefully, however: cluttered European cities can be distracting if the contrast between the roads and surrounding earth is too high. Everpix is a very Web 1.0 wallpaper app. It includes all the corny photos you’d expect to find in a mid-2000s collection of cool wallpaper picks, with brief interstitial ads thrown in every so often. But if your tastes tend to run a little less contemporary, you might find refuge here. Of the apps providing older-style imagery, Everpix is one of the very few that won’t trick you into an expensive subscription once your ‘free trial’ runs out. Clarity is another one of these apps that’s more for making wallpaper. It can edit existing pictures with detailed and specific tools, or create a simple color gradient from scratch. The gradient tool is really easy to use, which makes it a step up over Photoshop. You can also blur images, add a semi-opaque gradient on top of the image, or use a blurred frame effect. There is a gallery of acceptable images you can choose from, but nothing truly inspired. Mostly, it’s the gradient tool that’s my main draw. Named in the style of MGMT, WLPPR collects aerial shots of Earth and other heavenly bodies. Some are true color, some are false color, but all are captivating. Some wallpaper packs must be purchased, but the quality of the imagery means it’s not a rip-off job. Plus, just $4 gets you the whole set, so it’s far from egregious. There really are some truly exemplary examples of atmospheric and celestial photography within the app, just waiting for your to unlock it. Zedge is probably the largest wallpaper app on the App Store, but not in sense of content. More in the sense of cultural presence. The app is comparatively ancient by iPhone standards, and quality hasn’t always remained high. But a recent survey of their collection shows a high number of unique and interesting images that would make wallpaper. You can get it on Walli. It’s called “Rocket” and the artist is Efren Yañez. If you like the shuttle, you’ll love his other work too. Unfortunately I can’t find a way to share a link to the particular wallpaper.